I read this article and found it very interesting, thought it might be something for you. The article is called How to Find a Work-Life Balance and is located at https://www.butfirstcoffeeblog.com/how-to-find-a-work-life-balance/. This past week I was lucky enough to be a guest on The Confused Millenial podcast. If you’re not privy, the podcast was launched by the creator of The Confused Millenial the blog, Rachel, and it’s all about navigating this whole “adulting” thing, from career to relationships to spirituality to business. In our discussion, we talked a lot about time management and finding purpose in your work. During the interview, Rachel asked me, “do you believe there is such a thing as a “work-life balance.” And, I immediately knew my answer – “yea, duh!” But, it also got me thinking that the answer to this question might not be as obvious or clear to many people. To many people, the idea of a work-life balance might seem impossible. Rachel mentioned to me in the podcast that she’d interviewed top CEOs who told her there is no such thing as a work-life balance. But, I just have to call B.S. on that because I believe there is, 100%. But, you do have to be strategic about it. I work a full-time job, run this blog and my YouTube channel, and still find time for real life. I don’t have any special potions or magic pills. 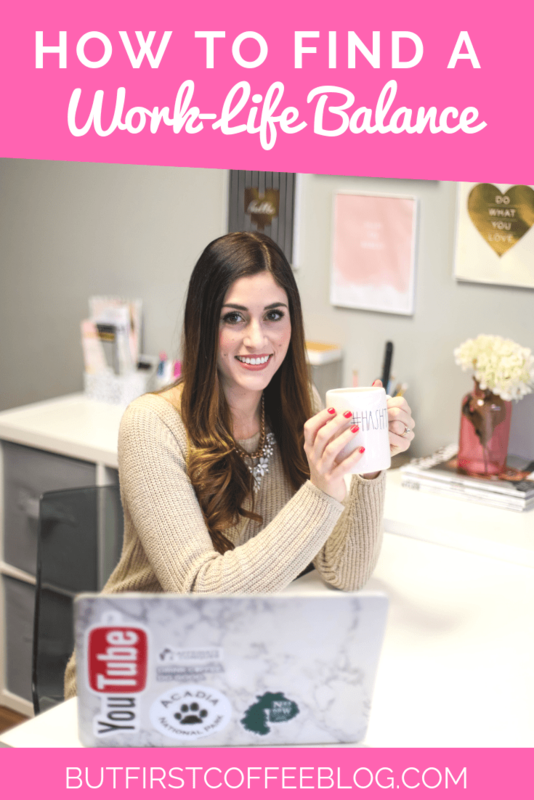 It’s all about balance, and so today I’m going to share some of my best tips for achieving a work-life balance. First things first: MY work/life balance formula and your work/life balance formula are NOT the same. And my formula isn’t the same as it was 2 years ago and certainly isn’t the same as it’ll be in 2 months when I’m taking care of a newborn. The first step to finding balance is understanding what your formula is and not trying to recreate someone else’s. What does this balance look like? Does it mean having time to make a homemade dinner every night? Does it mean finding the flexibility to be able to be home when your kids get home from school? Are you looking for a job that allows you to never have to work weekends? Are you looking for a job that allows you to work on your side hustle on the side? Establish what your goal is for work/life balance. Now, this next section is all about your job. Obviously, one of the biggest hurdles to a work/life balance could be having a job that doesn’t fit it. This might be where things get a little dicey and probably where most people back out and say, “that’s impossible!” But, the truth is, if you have a job that makes it impossible for you to achieve your version of work/life balance then you’ll never achieve it. **NOTE: This section talks about finding a job that matches your ideal work/life balance. I understand we’re not all in a place where we can just switch jobs at the snap of a finger. However, having a job that matches your ideal balance is key to success. You may not be in a place where you can switch jobs right this second, but if the job doesn’t match your ideals you should make it a long-term goal for 6 months or 12 months. Listen to my story below of how I changed careers. It took me over a year to make the decision and switch but ultimately led to the balance I wanted. I went to college for Education. I KNEW I wanted to be a teacher. I was teaching preschool at the time and had been working with children for 4-5 years. I loved teaching and I loved the profession of Education. After college, I took my Praxis exams, got certified to teach in the state of Connecticut, and started teaching English as a Second Language. I really enjoyed it. I adored my students, I liked what I was doing, and I had a strong feeling of purpose and fulfillment in my job. You Might Also Like: Ready to Conquer YouTube? The e-course is finally here. I spent maybe a year considering leaving the education world. At the same time, I continued to develop my side hustle of blogging. I spent a lot of time self-teaching myself, learning about the world of the internet, SEO, SEM, and social media marketing. When I was finally ready to make the career move, I built a resume based mostly on this experience that was self-taught. And then, I was strategic about the positions I looked for to find something that would match the work/life balance I wanted. I started by making a list of the things I wanted in a job. With this set of “rules” in place, I started applying and interviewing for jobs. From my experience, it’s really hard to gain a good grasp of a company and the position from a job posting, so I applied to a lot of positions even if I wasn’t 100% sure about them. I interviewed for jobs even if I didn’t think I’d like them simply for the experience of interviewing and to gain a better idea of the jobs out there, the company’s style, etc. But, most importantly, I looked for a job that was the right match for me. There’s a lot of weight on our careers. It’s something pretty much every person at every event or gathering will ask you. “What do you do?” has got to be up there with small talk’s top questions along with “where are you from?” and “what’s your name?” Not to mention, for many of us our career is a part of our identity. We want to strive for success and having a good, impressive job gives us a feeling of confidence and empowerment. But, it’s easy to get caught up in this when job hunting. We might judge a company based on its reputation, get blinded by a huge salary increase, and, ultimately, end up choosing the wrong thing. That’s why having your list for an ideal job is so important. Keep your eye on the prize and look for the job that is going to fit you and your ideals. To finish my personal story, I ended up taking a job at a small, local company. It was about 15 minutes from home, no nights or weekends, and allowed me to learn a bunch of new skills I didn’t know (such as more advanced web development, pay-per-click advertising, local SEO, etc.) The company wasn’t flashy, the office wasn’t some hip, progressive place with a cappuccino machine and a “bring your dog to work” policy. And, my pay increase was small. But, within my first year, I was able to learn A TON, dedicate more time to my side hustle, and even ending up getting promoted to Manager which gave me an increase in pay and an even more interesting and fulfilling position. Planning in your non-work time will set the precedence so that when that time comes around, you’ll know it’s not for work. On these days/nights I don’t take out my computer and I don’t bring in work from the car. I know it’s time NOT to work. These breaks are really important to allow you to recharge. It’s harder and harder to find a work/life balance as more and more of us work from home. When you work from home the line between work and life can become a little blurred. It’s a lot easier to leave the office and be done with work. But when your home IS your office, things get tricky. I think this is something so many of us do and can make finding balance near impossible. Stop overloading your plate and taking on more tasks than you need to. While you might be able to juggle all those plates for a little while, eventually you’ll burn out and drop the ball (or all of them). You don’t need to be a superhero. You don’t need to do IT ALL. Prioritize your more important tasks and responsibilities and let go of the things you don’t need to do. An example of this for me is with my blog. A blog can easily be a full-time job (for many people it is). But, my blog is a part-time endeavor, so I can’t try to treat it like a full-time position. I have to choose things to say “no” to keep my plate from being overwhelmed. For me, that includes NOT writing 2-3 posts a week but instead limited it to 1 or 2 at max. It means NOT trying to market myself on all social medias, but instead just focus on the ones that benefit me the most. It means NOT working with many brands/companies and just choosing the ones the best suit me. I try to prioritize my most important tasks a few ways: I look at the ones that are the most beneficial to me and which ones give me fulfillment and purpose. Ok, what nonsense is this? We all get 24-hours in a day, Kallie. How the heck am I supposed to find MORE time in my day? 1. Limit your time-wasting activities: Many of us have tasks in our day that waste time but we just do them now out of habit. Locate the tasks and activities in your life that take up time but don’t offer you anything in return. This could be spending too much time browsing social media, getting caught up reading every email that comes in, a task at work that isn’t even your job duty but you’ve just sort of taken on. Be smart and strategic in locating the time-wasting activities in your day/week and aim to find a way to remove them. Check out my post on how to be more productive for more tips on this. 2. Wake up earlier: You all know that I am a morning person. Mornings can be extremely productive times of the day. You can use it to get work done, take care of housework, and get a jumpstart on your day so that later in the afternoon/evening you have more free time for yourself. You’re not going to achieve a work/life balance overnight. Just like with trying to lose weight, you can’t be overly optimistic and say “I’m going to lose 20 lbs. in 2 weeks.” The same applies to your time. You’re not going to go from having no free time to 30 hours of free time a week. Set yourself a long-term goal, and then set yourself small weekly and monthly goals that will get you there. Wedding Wednesday: Will you be my bridesmaid? Nothing happens around here before coffee, so pour a cup and join me. If it saves you money or saves you time, I’m blogging about it here on But First, Coffee.